Mali Mish - Day 2: Leaving Cedar City with a new set of tires. Day 2: Leaving Cedar City with a new set of tires. Last night we boondocked at a Walmart at the edge of Cedar City, Utah. It was a great feeling to finally have some relief from the heat. At 5,800 feet, the outside temperature dropped into the 50s just before sunrise. It was so nice to be back in the Mish again and everyone slept in. We are now in completely foreign territory. 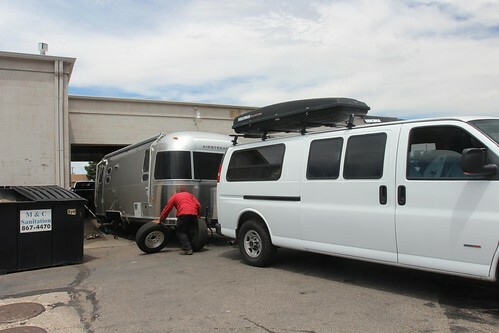 We have never been to these parts of the country before so we had to make sure we don’t get caught off guard on some of the regular maintenance work on the Airstream as well as the van. We spent a good 1-2 hours after breakfast in the parking lot just taking care of that. We decided that today was the day to get new tires before veering off of I-15 and into more remote locations. The Mish has been rolling on the same tires as the ones that came off of the factory assembly line. With the exception of one that had the notorious broken steel belt that probably came close to a highway blowout on our way to Bayou Segnette State Park near New Orleans, LA. We have been hoping to try Michelin LTX tire on 16-inch wheels since Rich from Airstream Life raved about them last year. But that involves getting all 4 new tires as well as larger rims. It is probably a $1,500 investment to do it all in one shot and we are just not quite ready for that during a trip like this. The safer and cheaper bet is to get some decent trailer tires that fit our existing rims but we did not want to go back to Goodyear Marathons. We actually didn’t have much of a selection to choose from at the few tire shops in Cedar City. The only thing they had that were these off-brand Commodore ST tires. They were inexpensive and has a load rating of E at 2,850 lbs per tire with 80 psi. It probably doesn’t mean a whole lot but they are definitely better than the old 2006 vintage tires that came off of them. 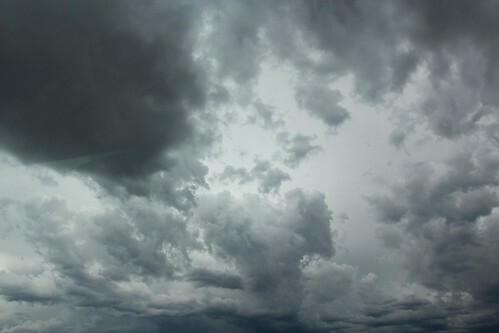 We finally headed out under cloudy skies northbound on I-15 with Bryce Canyon as a destination. The goal today is to find a nice full hookup site at a decent campground without taking out another mortgage. Every place we were able to look up online and called wanted to charge 40-50 bucks a night. I guess if you are near a popular national park, you can charge these kinds of rates but we just refuse to pay that anywhere outside of California and Florida. We just knew there had to be other options. We have been really impressed with Utah so far. The mountain ranges, the nice roads and clean cities. 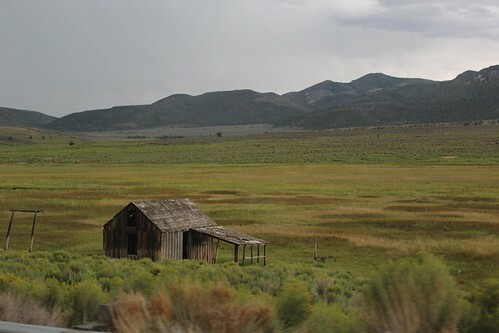 We can’t help but to take photos of everything we see and Marlene today was particularly enamored with these old barns on the sides of the road. We turned off of I-15 and onto highway 20 going towards Bryce Canyon. 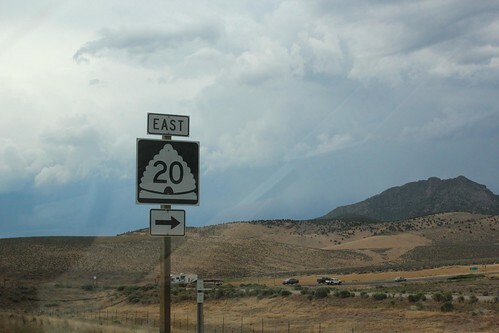 I had not known this but apparently Utah is referred to as the beehive state and the emblem is on all of their highway signs. We did some more climbing today with the Airstream and got up as high as 8,000 ft in elevation. 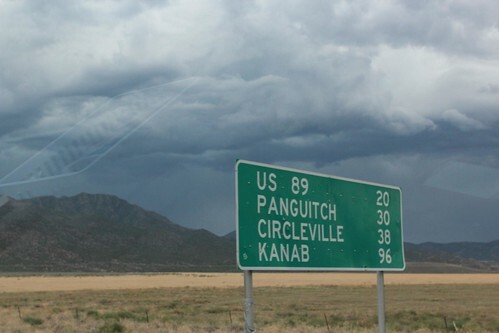 However we didn’t stay that high and eventually came down to about 6,600 at our destination of Panguitch, Utah. It is a really small town of about 1,500 people. The town originally manufactured bricks for a lot of the pioneers who homesteaded in the area. It still has many of the original buildings that were built using those bricks. Unlike Whiskey Row in Prescott, AZ or Allen Street in Tombstone, not too many originally buildings are still standing there with all the fires that have burned their wooden structures to the ground over the years. I was glad to see food truck wraps Denver, which looked unusual in that place. 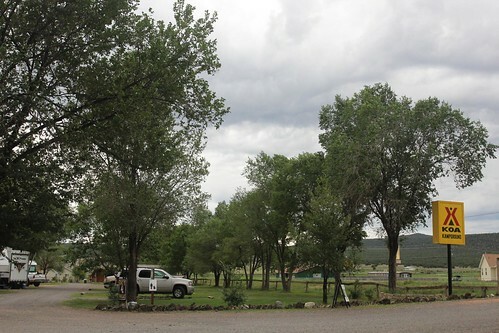 Our first stop was to the KOA at the end of town in Panguitch but decided to go to a more local campground just down the street from it. 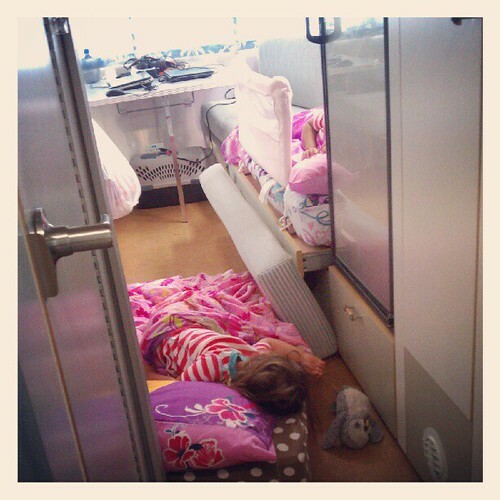 The KOA was almost twice the nightly price and didn’t really offer any more amenities. I guess they have to pay those franchise fees somehow. 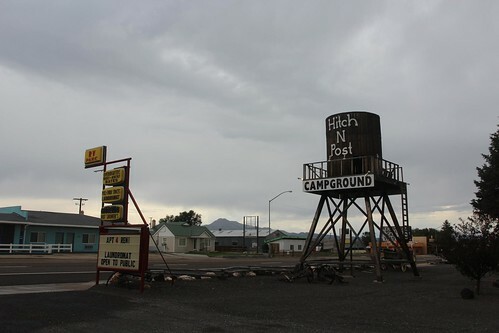 Less than a mile down the road was a neat little campground called the Hitch N Post. 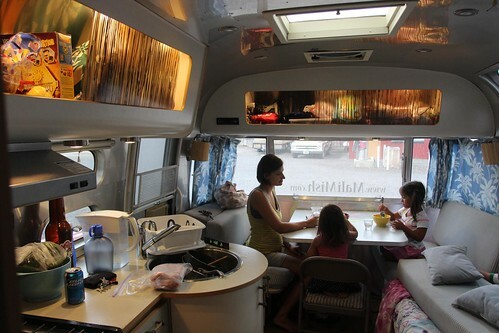 It had full hookups, laundry and hot showers for $25 including tax. That works for me. The girls were happy to finally get out of the car and relax a little. It is our first full hookup campground since we left Los Angeles. We will probably stay here for at least 3 nights before making our way closer towards Colorado. 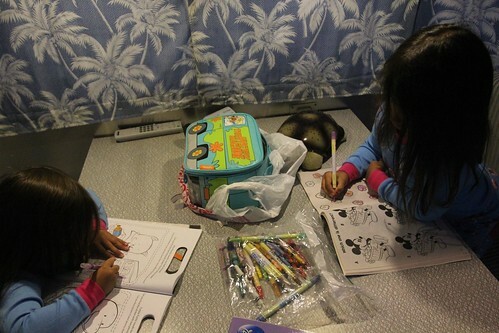 Time to bust out some art projects before these kids get bored already of being on this trip. Today was mostly a transit day but I decided to shoot some video throughout the day as a new way to document our trip. We always enjoyed looking back at our old trip photos and reading old blog posts but have always thought it would be cool if there were more videos. Keep in mind that these videos are shot and edited somewhat hastily so lowering your expectations is the key to enjoying them 🙂 We will try to post more regular videos in this style and I promise you that we will have more exciting ones in the future. Day 1: Escaping the Las Vegas Desert Heat in Utah. 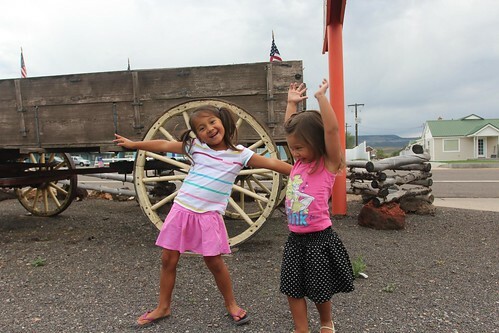 Day 3: Thunderstorms and Ice Cream in Panguitch, Utah. 8 Responses to Day 2: Leaving Cedar City with a new set of tires. I am enjoying the story of your travels. Best wishes to you all! Wish I were on the road right now also! How are you all finding campsites? Do you use a AAA campbook, or what? Us girls obviously do not like to be on camera. Haha. I also think that $46.00 per night is ridiculous. You don’t find too many campsites with RV wash sites and a vacuum, so that is very nice. My husband is interested in reading about your installing solar on Mali Mish!